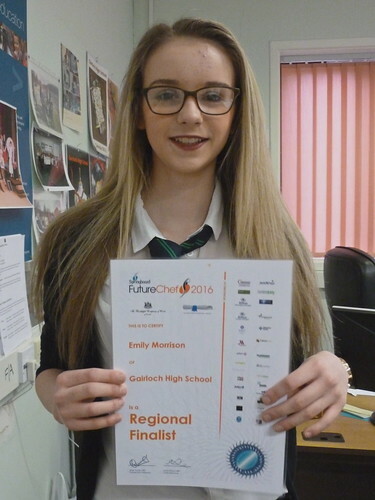 Futurechef Regional Final 2016 – S3 pupil Emily Morrison returned to Inverness on Monday 8th February to take part in the regional final of Futurechef 2016. As one of three from Highland Emily found herself competing with nine others from as far afield as Aberdeen. Emily held her cool and having done lots of preparation beforehand she finished third. Emily was presented with a set of personalised whites for use in the kitchen. Mr Port thanked Kirsty Thistlethwaite (West Highland College) and Rosie Kirkness (former pupil of Gairloch, professional chef and previously successful in Futurechef) for helping Emily prepare for this competition. And of course – Well done Emily! UNICEF Non-uniform Day – Friday 12th February was our annual non-uniform day in aid of Unicef, a leading international charity supporting children. Pupils and staff had the opportunity to wear non-uniform in return for a minimum £1 contribution towards this worthwhile cause. Those wearing a hat helped to raise even more money by contributing an extra 50p! The amount donated was £135. 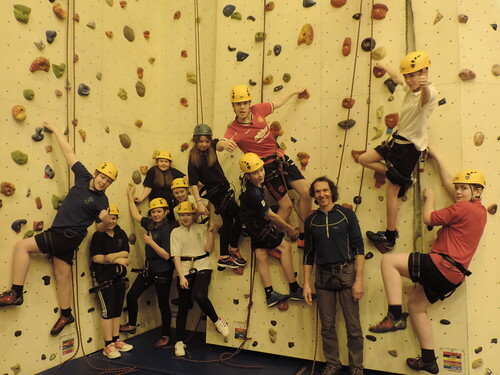 Local Climbers help in school – The S1 SMART class have successfully completed a four-week block of climbing with Paul Tattersall. Paul volunteered his time and experience to take pupils through their NICAS Level 1 certificate which involves operating safely on the climbing wall and completing at least 10 belays and climbs each. Pupils started with varied climbing experience and all overcame challenges and fears during the sessions. S6 Outdoor Education pupils assisted Paul train the pupils. The other half of S1 were trained and prepared by Mr Sutherland and all S1 received their NICAS books at assembly. The complete award will be presented to each S1 at Prizegiving in June. Click on the image above to see lots more photos and a couple of videos! 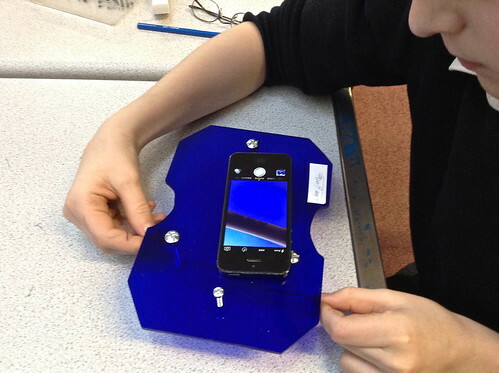 Smart CDT Microscopes – S1 pupils have also been busy building microscopes in Craft Design and Technology. The project helps the pupils investigate standard components in the design of products before manufacture. Pupils can now view and photograph various things under their microscope using their smartphone camera or an iPad. In C.D.T pupils looked at the soldered joint between electronic components, helping them to see if the circuit would fail. You can see Liam Forbes using his device in the photograph. S1 will also use the microscopes in SMART and Science. We plan to repeat the project each year so eventually all pupils will have a microscope in school. We are also hoping to use the microscopes with any new ICT that comes into school in future. Former Pupil update – We have heard that Roxanne Ramsay has passed her exams and will graduate a doctor from Manchester Medical School in the summer. At the moment she is preparing to head for Grenada to complete her Elective. Roxanne’s brother Andrew graduated in November from the University of London School of Architecture, Computing and Engineering with an MSc in Renewable Energy and the Built Environment. Andrew completed his studies at the renowned Centre for Alternative Technology (CAT) in Wales. Congratulations to both of our former pupils! As always if you have information about any of our former pupils please let us know. We like to pass on information on our former pupil website and encourage the current pupils with ambitions of what they might achieve. Photo Competition Success – GeoBus is an educational outreach programme run by the University of St Andrews and supported by industry. The group have visited the school several times over the last few years. To celebrate their 4th birthday they ran an exciting photo competition, looking for entries related to geology and geography. Fraser Wotherspoon (S6) and Miss Smith sent in entries, along with over 60 other pupils and teachers from across Scotland. 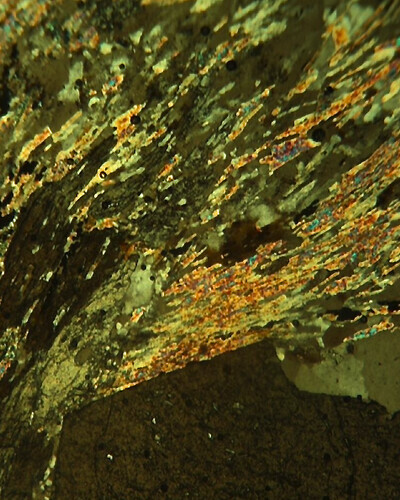 Fraser’s photo of a Mica Schist (metamorphic rock) thin section and the microscope he was using was picked out as one of the top 12, along with Miss Smith’s photograph of a Torridonian Sandstone erratic on Achtercairn Hill. These will both feature in the Geobus 2016/17 calendar with prizes to be presented at Assembly! You can see the full colour images on the school website. Environmental Creativity – S1 have begun work on the Shell Bright Ideas challenge, a STEM competition looking at coming up with innovative solutions to some of the world’s likely future energy problems. More to come in future editions! 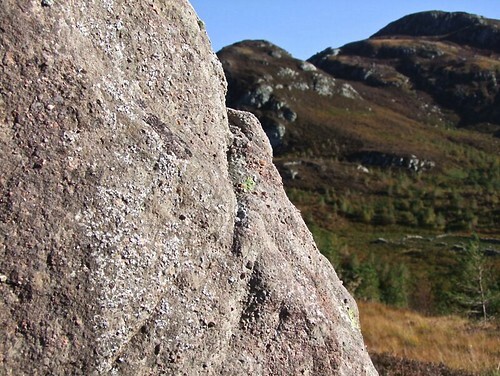 It’s that time again – the GRAND annual fundraiser for S1 Cairngorm Week is coming soon. 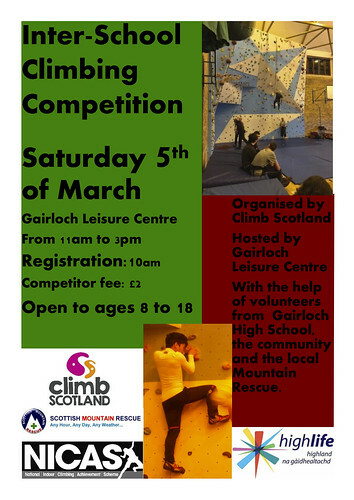 Each year, S1 pupils organise a Bring and Buy Sale in Gairloch Community Hall to raise money towards the costs of their outdoor activities week in the Cairngorms in May. Each pupil attends the residential week in May, which will be from Monday 9th to Friday 13th May this year, and the charge for the week is minimal. Most of the money required to fund activities, food and accommodation comes from the school fund and the profits of the Bring and Buy Sale. The Sale is organised by the S1 pupils themselves, with support from staff and parents, including the Parent Council. It is a valuable experience for the pupils in developing many skills, including those of teamwork and communication. In the past, this has been a very successful event, with tremendous support from families and the community. You may be approached soon and asked to donate a prize for the amazing raffle. Lets hope you find it impossible to refuse the smiling S1 pupil who makes the request!